From sun up until long after the sun goes down, your house is going to be loud and chaotic. If you like things orderly and quiet, a big family is not for you. I'm not kidding when I say your house will always be loud, but I wouldn't have it any other way. Their laughter and giggles as they play together make life worth while. 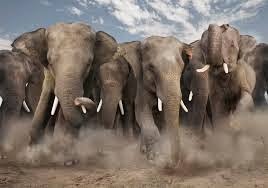 Yes, it may sound like a herd of elephants is going through your house all day, but they are a happy herd of elephants, which is the best feeling in the world. Really and truly, you'll never have a moment to yourself, unless it's at 2 AM after everyone has fallen asleep. Every time you turn around, there is someone who needs something or wants to do something. Think you'll get a moment alone when you take a shower? Forget about it. Kids seem to have this hidden instinct that tells them when the bathroom door closes. There will always be knocking and fingers under the door. Although it can get pretty overwhelming at times, all too quickly the days of your children needing you will be gone. I simply don't know what I would do with a spare moment to myself. Raising a large family is expensive! And, gets more expensive the older they get. Someone always needs shoes, or has to go to the doctor, and, of course, they expect to be fed. Trust me, they eat a lot! If you don't have the financial means to support a large family, it's not for you. Raising any child takes patience, but when you multiply that by 4 or 5, you need to have extra patience. It takes a lot of time taking care of each child's specific needs. If you're the type of person who is always in a rush or simply lacks patience, a large family isn't for you. Cleaning after a large family is a never ending and thankless duty. It doesn't matter how much you clean. Every time you turn around there's laundry that needs washed, dirty dishes, and endless sticky finger prints. If you are a neat freak or like everything tidy, a large family may not be the thing for you. From your house and car to even pizzas, everything has to be super-sized when it comes to raising large families. Even your bank account. You have to be prepared to ditch that awesome sports car for a gas guzzling SUV. Have fun finding a table big enough to seat everyone, too. Although I never expected to be the mini-van driving mom, I absolutely love it. Yes, everything needs to be bigger when you have a large family, but it's just more to love. One of the most difficult things for us is trying to find a babysitter. It's nearly impossible to find someone who will watch all of the kids together at one time. Often, when people hear how many kids you have, they instantly up the price and make excuses to try to get out of it. There's never a moment to rest when you have a large family. There is always some where to go or something that needs done. If you like to sit around and relax, those days will be over when you have a big family. I'm the type of person who can't sit still and do nothing, so it's perfect for me. Plus, I love being involved in my children's lives and making the best home possible for them. No matter how many children you have, you need to be able to put your children first in every single way. If you can't put your children before yourself, don't have kids...period! When you have a large family to raise, the sacrifices you make are a lot larger than those you make when you only have 1 or 2 children. If you can't or aren't willing to do what's best for your children all of the time, don't reproduce. Raising a large family isn't a bag thing, but you do need to be prepared for how life will change. And, like I said, it's not for everyone. Yes, it can be loud, chaotic, stressful, messy, and expensive, but I love every single minute of it. Their smiles, giggles, hugs, and laughter make every second of the chaos worth it.